In vivo imaging during the drug development process can drastically reduce time and costs. Imaging in preclinical research requires excellent quantitative reproducibility and low X-ray dose. At SCANCO Medical both of these requirements are central in our design and development of cutting-edge in vivo microCT systems. vivaCT 40 and vivaCT 75 deliver outstanding high-resolution in vivo images. Fast scan times and an innovative design minimize the X-ray dose, allowing repeated scanning of individuals during a study. Field-of-view can be varied mechanically, increasing resolution for smaller scan sizes without affecting scan time. Real-time control of scanning in response to physiological events such as respiration is supported by an optional monitoring and gating unit. The newest generation of in-vivo scanner, the vivaCT 80, is offering the largest field-of-view (80 mm) and the best resolution (5 µm) in its class. The vivaCT 80 is the most versatile scanner for in-vivo X-ray micro computed-tomography imaging of mice, rats, and rabbits. The new integrated monitoring and gating system allows flawless animal handling and high throughput. XtremeCT, originally designed for clinical research, is an exceptionally versatile tool for preclinical studies that require a large field-of-view. The vivaCT 80 is the in-vivo microCT scanner that offers the largest field-of-view (80 mm) and the best resolution (5 µm) in its category and is hence the most versatile scanner for the in-vivo X-ray micro computed-tomography imaging of mice, rats, and extremities of larger animals up to small rabbits. The vivaCT 80 benefits from a narrow cone beam angle geometry and a mechanically adjustable field-of-view for best image quality at low radiation dose. Fast scan speed at intermediate and lower resolutions is supported by the new scanner mechanics. The new integrated monitoring and gating system allows flawless animal handling and high throughput. Interchangeable units give the possibility of monitoring multiple animals simultaneously: while scanning a subject, the next one can be sedated and its temperature and heart rate can be monitored and recorded. The animal is then loaded into the scanner with its dedicated monitoring unit, thus making the whole preparation process more efficient. Observation camera, heating, ambient temperature monitoring, and respiratory gating are also integrated in the system and are controlled from a touch display. 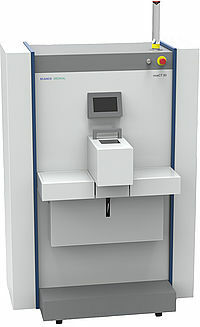 With this configuration, extremities of larger laboratory animals, such as small rabbits, can be scanned.